It’s natural in discussions of planning and development issues to focus limited energy on the areas where Melbourne could do better. But it’s easy to forget our blessings – the areas where Melbourne is doing well. That’s not to say that things couldn’t be better, but it acknowledges there are some areas where things could be much worse. 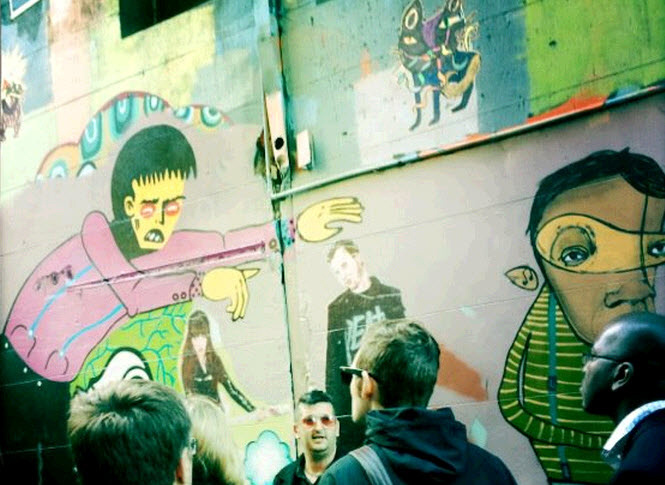 It’s conceivable there are even areas where Melbourne punches well above its weight. It’s the season of goodwill, so I thought it timely to look at the positives. Hopefully readers will have some suggestions too. One of Melbourne’s great blessings is its extensive rail system. Please, while your first reaction might be disbelief, many cities elsewhere – in the US for example – don’t have anything even remotely as good as our network. And our tram system is reputedly the largest in the world. Again, many cities elsewhere are scrambling to retro-fit light rail and streetcar systems. We have rolling stock that’s getting friendlier for wheel chairs and successive governments have (belatedly) ordered new trains and trams. In many places if you change modes you have to pay again. Not in Melbourne – there’s unlimited travel on a single ticket within a time window no matter how many times you transfer. While it’s had teething problems and isn’t out of the woods just yet, we have a smartcard system too. And two high frequency bus services now orbit the suburbs from the deep south to the west and from (relatively) early till late. Heck, I even heard there’s an extra NightRider service next weekend. The Regional Rail Link has gotten the green light and design work is continuing on Melbourne Metro. It’s not good enough for most people I know, but we have a 24/7 airport public transport service operating at 10 minute frequencies for the great bulk of the day. Fortunately, large parts of our freeway system are tolled. There are significant barriers to getting a drivers licence in terms of time and out-of-pocket costs. And just this week the Government had the good sense to bang up registration charges. Successive governments and councils have promoted high density residential growth in the city centre. New inner city brownfields sites such as Fishermans Bend have been earmarked for development. There are large tracts of historic housing in areas like Fitzroy Nth and Carlton Nth that are largely intact. And we have inner city parks and the glorious Yarra River park system that other cities would die for. One of Melbourne’s great assets is it has capacity for growth in the west, still within a reasonable distance of the CBD. Average lot sizes in all the growth areas are smaller than the older middle ring suburbs and getting smaller. Perhaps the jewel in the crown is the wonderful and vibrant city centre. Its laneways and public spaces are rightly the envy of other cities who think (mistakenly) that they can replicate Melbourne’s success. I believe (admittedly without much hard evidence) that within ten years or less, inner Melbourne will be widely acknowledged as one of the world’s coolest cities (that’s a prediction!). Many major trip generators like the MCG are located in the centre, where peak crowds can best be served by public transport (unlike, say, Brisbane’s entertainment centre at Boondall). That’s a start. I’ve focussed mainly on infrastructure, but there are also institutions and people who give Melbourne a positive outlook. For example, I reckon the Lord Mayor, to the surprise of many, is a real asset. I’d like to think there are some areas of social and cultural policy where we do well too. Anyone else got any ideas on what Melbourne does well? P.S. 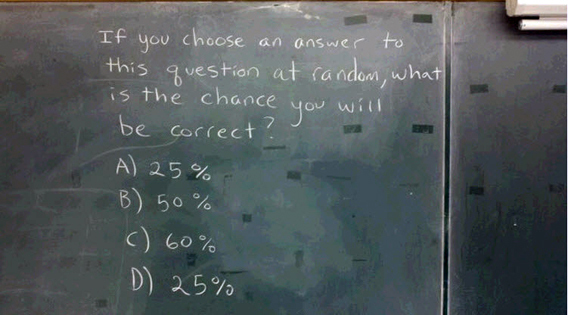 More on that statistics question. Would we use an airport train (as much as we say we would)? Yesterday’s post on the unreliability of predictions fits nicely with the latest round of calls for a rail line to the airport. The stimulus this time is a report in The Age last week on Melbourne Airport’s plans to upgrade freeway access and build a new terminal. It set off a predictable and familiar landslide of calls for a train line. There were 141 comments on the article, virtually all of them advocating an airport train. I must say that I’ve hardly met a Melburnian who doesn’t think an airport train should be a high priority of any and all governments. Some doubtless think others would use a train and thus, they imagine, reduce congestion on roads leading to the airport. But I expect most see themselves avoiding gridlock, punitive airport parking fees, or high taxi fares by using the train for most of their airport travel. And yet if the train were built, there’s no doubt their prediction would prove to be enormously over-optimistic. Brisbane has a train from the CBD to the airport that carries just 5% of all travellers (another 3% come by bus). Sydney has a train too – it only carries 10% of all travellers (and a further 2% access the airport by bus). As Jarrett Walker observes, the political popularity of airport rail “is always several orders of magnitude above its actual ridership”. Is there any reason to think that a train to Melbourne airport would increase public transport’s existing share of travel by a significantly greater amount than the trains have in these other cities? Even without a train, Melbourne Airport already has a higher public transport mode share than either Sydney or Brisbane, with 14% of travellers accessing the terminal by bus. The former Government’s specification for a future airport train was a $16 fare, 20 minute trip time and 15 minute frequency. That’s much the same as SkyBus provides at present. It’s true trains are generally more appealing than buses, but I can’t see that’s likely to lift public transport’s share significantly – certainly it hasn’t been enough in Brisbane and Sydney. It’s more likely it would cannibalise SkyBus and perhaps gain one or two additional percentage points of mode share. If the latent demand for better public transport service between the airport and the CBD was as strong as readers of The Age think, then SkyBus – which offers the best frequencies and span of hours of any public transport service in Melbourne – should be doing much better than it is now (and it’s doing quite well). It’s often argued that if an airport train were priced at a Zone 1-2 fare, it would attract higher patronage than SkyBus. That’s likely to be true, but it’s totally unrealistic – no Government is going to spend billions on an airport rail line and then subsidise its operations. And nor should it. In any event, I doubt the increase in patronage would be anywhere near as dramatic as some assume. There is a host of reasons why the great majority of travellers would still prefer to drive or take a taxi than pay even a Zone 1-2 fare. For example, most airport trips are to or from homes and workplaces in the suburbs – a taxi or a car is usually going to be more convenient than going to the local station and transferring to the airport service at Southern Cross. For many regular travellers, taxis and parking are cheap because they’re a business cost. Planners invariably work on the basis that bus and tram users will walk no more than 400 metres from home to the nearest stop. It’s known travellers will walk further to catch a train, so the maximum walk distance to a station is accordingly usually taken as 800 metres. So it’s interesting to look at what travellers actually do. Data from the VISTA travel survey shows the median walk distance to the bus in Melbourne is 500 metres, with a quarter walking more than 800 metres. Half of Melbourne’s train travellers walk more than 800 metres and a quarter more than 1.3 kilometres! Hence bus and train users in Melbourne walk much longer distances than the standards assume. 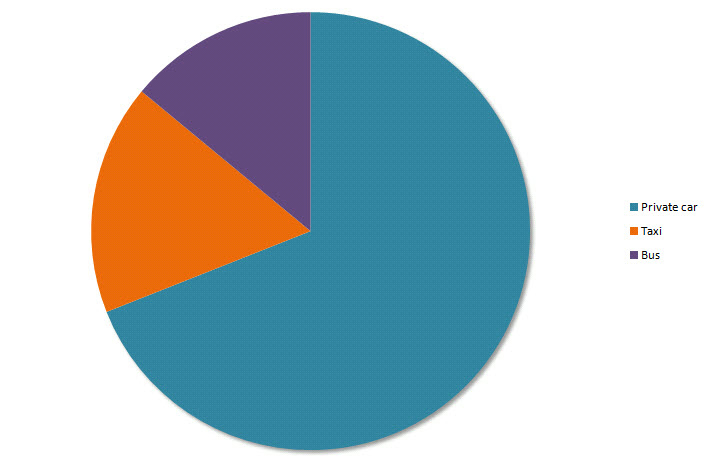 If the VISTA methodology is right, these findings can be interpreted a number of ways. One is that travellers have to walk unreasonably long distances in Melbourne, perhaps because bus and train coverage is too sparse, or stops are poorly located. Alternatively, it could show travellers are prepared to walk much further than planners have historically assumed (I’m sure some would even argue the exercise is good for them!). Standards like 400/800 metres are often justified on the grounds that if travellers have to walk any further, they will choose to drive instead, thus lowering the demand for public transport. It’s argued that trains can command longer walk distances because experience shows travellers will walk further if they’re taking long trips, or if the mode is fast (train trips tend to be much longer than other modes, both public and private, and also faster because they have their own dedicated right-of-way). While that’s all fair enough, I don’t think it draws out the policy implications as clearly as it might. I think there’s another way of interpreting the data on trains in particular. Trips by train are indeed longer and faster than those by other modes, but the key reason travellers walk long distances to stations is they have to – they don’t have a choice. 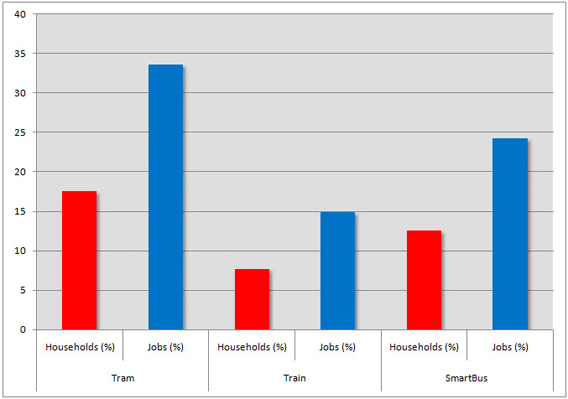 That’s primarily because the key market for trains is workers travelling from the suburbs to the city centre. Driving simply isn’t a realistic option for most of these commuters – parking in or close to the centre is too expensive and the combination of distance and traffic makes driving too slow and too costly. Limited parking means it’s also hard to drive to the station. In addition, there are all those “captive” travellers who don’t have access to a car or can’t drive (e.g. students) but have high value trips to make. In other words there are many trips where the car is simply not a realistic alternative to the train. In these cases the maximum distance people are prepared to walk (or have to walk!) is much longer than the standard 800 metre maximum. Not having an alternative, train users walk as far as they have to. In fact the mean distance train travellers walk from home to the station in Melbourne is one kilometre. That’s a lot further than the median (800 metres) and suggests there’s a long tail of travellers who walk a very long distance from home to the station. Accepting the legitimacy of longer walk distances could possibly have implications in a number of areas, for example in the design of feeder bus services, the spatial extent of development around stations, and in some cases even the spacing of stations. But most stations are already a considerable distance apart, so the practical implications are probably limited. Will Baillieu abandon Melbourne Metro (in favour of the East-West road tunnel)? Vic government tunnels under greenies. A Victorian political spy reckons the Baillieu government is about to resurrect the East-West road tunnel underneath Royal Park at the expense of the Labor government’s planned Melbourne Metro scheme. It’s “a big up-yours to all the inner-city greenies that gave the old government such a run-around,” they say. Assuming the Crikey report is well-founded (and it might not be – it is only a rumour, after all), I wouldn’t expect any government would be silly enough to announce it is abandoning a rail project in favour of a road project. No, it would say it’s going to do both. The road would simply get priority over the rail project when scarce capital funds are doled out. The $40 million already allocated from Infrastructure Australia for Melbourne Metro will continue to be applied to feasibility studies and planning approvals, but if Crikey’s report is true, the project will languish for want of the billions needed to build it. If that’s what’s intended by the Government, it could create an enormous problem. I’m not so much concerned that the Government might dare to build a new freeway as I am about the possible loss of the Melbourne Metro project. Melbourne Metro is a response to the looming shortfall in capacity in the city’s rail system. What’s needed to expand capacity, according to the Eddington Report, is a new line in the CBD, essentially linking Flinders St and Southern Cross stations. This could be achieved with a relatively short tunnel. However Eddington recommended that it be done with a much more ambitious tunnel running from Footscray to The Domain (and ultimately Caulfield) with new stations at North Melbourne, Parkville, the CBD (two) and The Domain – see exhibit. The first option costs a lot less but the second provides more capacity and has wider economic benefits, especially in terms of enhanced urban development. If funding for Melbourne Metro is to be delayed (and again I emphasise the “if”), the Government needs to explain how it’s going to deal with the looming rail capacity problem in the city centre. Do trams provide better accessiblity than trains? New research by the Victorian Department of Transport (DoT) shows Melbourne’s tram system provides access to 34% of metropolitan jobs, whereas trains only give access to 15% (see first exhibit). 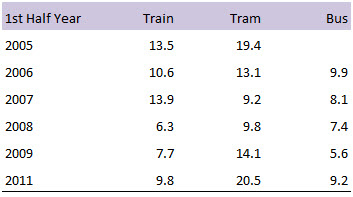 The analysis found trams also give better access to housing – 17% of metropolitan households are located close to a tram stop compared to 8% close to a train station. DoT calculated the proportion of metropolitan jobs and households located within 400 metres of tram, train and SmartBus stops, using 2006 Census data. The superior accessibility of trams might seem surprising given most popular discussion about public transport is focussed on trains. Moreover, trams and trains both serve the employment-rich CBD, so the difference in access to jobs is probably higher than most expect. The department doesn’t offer an explanation, however there are logical reasons for the superior showing of trams. These include the higher density of the tram route network, the greater frequency of stops, and the relatively high employment and housing densities in the central part of the metropolitan area served by the tram network (i.e. the inner city and inner suburbs). In the inner eastern suburbs, for example, there are nine parallel east-west tram lines between Victoria Rd and Glenhuntly Rd, a distance of just 8 km. The tram line on High St in Prahran is paralleled by another route just 560 metres to the north on Malvern Rd and one 650 metres to the south on Dandenong Rd. As shown in the second exhibit (under the fold), tram stops are much more closely spaced than train stations. Tram stops in the inner eastern suburbs are every 200-300 metres, whereas stations in this area are usually more than a kilometre apart. The tram network also services an area of high job density. The inner city – the area within 5 km of Melbourne Town Hall – might only have 28% of all metropolitan jobs, but they are concentrated in a relatively small area. Likewise, 50% of all jobs in Melbourne are more than 13 km from the centre, but the 0-13 km half is necessarily at much higher density than the 14+ km half. Compared to the tram system, the train network is relatively sparse, particularly in the middle and outer suburbs where not only the distance between the radial lines increases as a function of simple geometry, but the distance between stations also increases. The distance from Narre Warren station to Berwick station, for example, is over 4 km – the 400 metre walk radius assumed by DoT accordingly misses much more than it picks up. Suburban rail lines don’t in any event tend to be near jobs. As I’ve pointed out before, the vast bulk of suburban jobs aren’t located within large centres, but instead are relatively dispersed. Even the minority of jobs that is located in large centres tends to be spread out over a relatively extended area rather than concentrated within a small and neat 400 metre radius. Clayton is by far the largest concentration of jobs within Melbourne’s suburbs, yet very few of the jobs it contains are near a rail station. The second largest job concentration in the suburbs is Tullamarine, which isn’t served by rail at all. The high proportion of jobs accessible by SmartBus services signals clearly that most suburban jobs aren’t within 400 metres of a rail station. But providing potential access to lots of jobs is not the same as actually delivering workers to them. Trams might be within 400 metres of twice as many jobs as trains, but the latter nevertheless carry well over twice as many commuters to work each day as trams. There are a number of reasons for this difference. One is that the assumed 400 metre walk distance is harsh on rail. Commuters are prepared to walk further to their nearest stop if the overall journey is long. As rail work trips are on average much longer than tram trips, the assumed walk distance to a station is too restrictive – a distance of 800-1,000 metres would be more reasonable. Another reason is that many more train travellers get to their train station by other motorised modes – principally by car, but also by bus and tram – than is the case for trams. 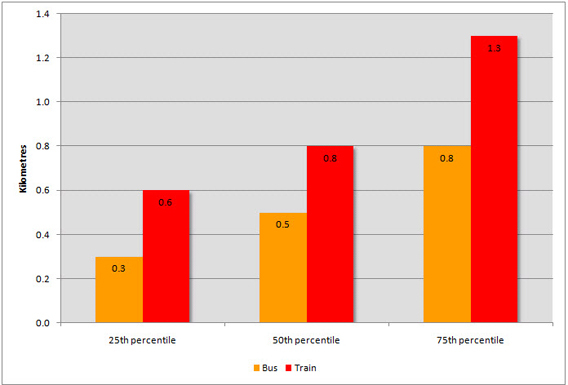 In fact half as many train travellers combine motorised modes as simply take the train direct. In contrast, the number of workers who use another motorised mode to connect with a tram as their main mode is quite small. What to do about fare evasion? Metlink released its Metropolitan Fare Evasion Survey on the weekend, which apparently shows 13.5% of trips on public transport in Melbourne in the first half of 2011 weren’t paid for. The figure for trams, where it’s easier to avoid paying, was much higher – The Age’s headline was One in five evading fares on trams (see exhibit). Metlink’s disappointed me before with its slipshod approach to customer focus and they’ve done it again this time. The survey was released to the media, but not to public transport users, so we can’t read it (in fact the most recent media release available on Metlink’s web site as of today is 17 August!). However fortunately The Age has cited some of the findings in this indignant editorial, Fare dodgers owe us all big time. I also stumbled across Metlink’s Network revenue protection plan 2010 which was released under FOI and made available publicly by The Age (I do like it when media use the power of the digital world to supply supporting documentation online). Metlink’s Network Revenue Protection report provides some interesting findings based on focus group research. I found it surprising only a small proportion of travellers actually always pay the fare – most people have not paid the fare at some time and some don’t pay frequently. The sorts of explanations offered are “because I didn’t have any change” or “because I could get away with it”. Some customers like the idea of ‘playing the game’ and actively take on the system. Many comments on The Age’s news report support this conclusion. Not paying fares is variously justified by difficulties with buying or validating tickets, inadequate information about ticketing requirements, poor quality of service, and expensive prices. Some suggest conductors should be restored to trams and some, with imaginative logic, say making public transport free would put paid to the problem of fare evasion (pun not intended). Trams present a particular difficulty for protecting revenue because they’re relatively “open”. It isn’t practical to have barriers at city stops like there are at loop rail stations. Even with the best of intentions, ticket purchase and validation can be difficult on a crowded tram. Chronic evaders can “hover” near a validation point and only use it if an inspector comes aboard.